I run a 12-week challenge a couple of times each year. Not some kind of fast track weight loss challenge, instead it is a program that focuses on good nutrition. Food is the one area that many people struggle with and in this program participants are guided through a framework of how to make food work for them, for life – to aid in weight loss, weight maintenance (even weight gain where needed), fitness and for strength. As part of the program, participants can look at their favourite meals and see how they can make them fit in to their new framework. Below is a recipe of one of my clients, that fits in to this healthy framework, and guess what? It is a delicious cheesecake!! Leave the cream cheese to come to room temperature. Make jelly by adding 3/4 cup boiling water into a bowl and when fully dissolved, add another 1/4 of cold water. While jelly continues to cool, add cream cheese to bowl with cottage cheese and yoghurt. Beat until creamy and fully combined. Add protein powder and beat until fully combined and then add flax seed oil and beat until fully combined. Slowly add about half the jelly mixture and continue to beat. Keep adding bit by bit until mixture is about the consistency of smooth custard (quite runny but still creamy). 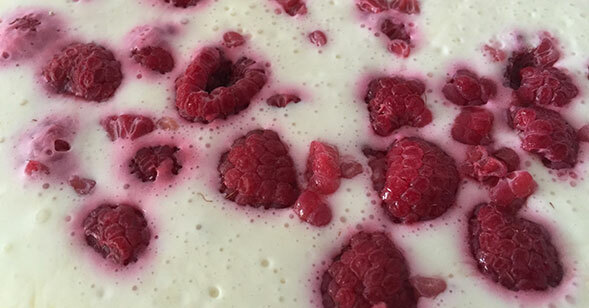 At this point you can stir through fruit of choice – In the photo in this post I added frozen raspberries. But you could try a whole range of fruit – peaches, pineapple, blueberries. Portion out into a bowl or glasses of choice (you can get between 6 and 8 portions depending on the size) and put into the refrigerator to set (at least 4 hours but ideally overnight).